Lasagna is one of our favorite pasta dishes, but it can be a hassle to make, considering you have to cook the noodles and prepare all the different layers individually. Thankfully, it’s easy to get the classic lasagna flavors we love in an easy slow-cooker soup that’ll have you coming back for more! 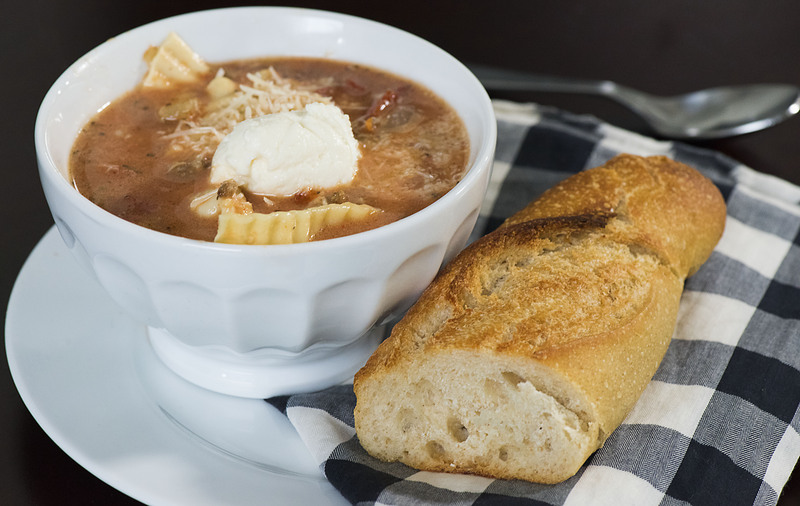 Filled with ground beef, tomatoes, onion, garlic and herbs, this soup is a breeze to make and it tastes phenomenal – make a big batch, ‘cause you’re going to want extra! Brown beef and onion in a large pan or skillet over medium-high heat until beef is cooked through and onion is softened. Season with salt and pepper, then add garlic and cook for another 1 minute. Drain fat and transfer beef to slow cooker. Add in chicken broth, tomatoes and tomato paste, then add oregano, basil, red pepper flakes and bay leaf. Season generously with salt and pepper and stir everything together. Cover, turn slow cooker on high and cook for 2 hours. Taste and adjust seasoning, if necessary, then stir in heavy cream and 3/4 cup parmesan cheese. Stir in pasta, then cook for another 20-30 minutes, or until al dente. In a separate bowl, mix ricotta, remaining parmesan cheese and lemon juice together. Season with salt and pepper and set aside. Once pasta is cooked, ladle soup into serving bowls, top with a dollop of lemon ricotta mixture and serve hot!